Fabric Mart Fabricistas: The Final Challenge! This is it! The final week! - All 10 of our contestants--- We obviously couldn't have done it without them! They were an amazing group of talented women who devoted a lot of their sewing time to this challenge! We cannot thank them enough! - Our Viewers - We hope the viewers had as much fun as we did seeing what the contestants made each week. Thank you for your votes, comments and support! - To our employees - A group of ladies who work in our store assisted in the second part of the voting process. Some with a lot of sewing experience, some without any sewing experience, but they took it very seriously. We thank them for taking some time out of their busy schedule to assist in the voting process. Being that this was our first challenge like this, we learned a lot along the way and we appreciate everyone's patience. One of the hardest things was to send someone home. We wish everyone could win! We hope EVERYONE had fun! Would you want to see us host a fashion challenge again? We asked the final three to create 3 pieces that can be worn together as one outfit or 2 outfits that could be worn to the same event. 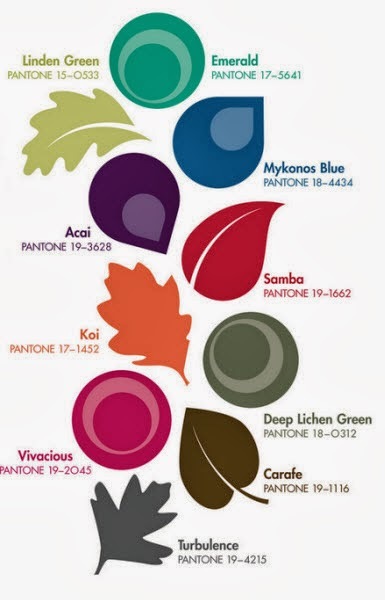 Using the Pantone Fall Color Chart, select 2 fall colors to inspire your outfit. The First Place Winner will receive $25.00 a month for one year to spend on fabric at Fabric Mart (worth $300!) Plus! 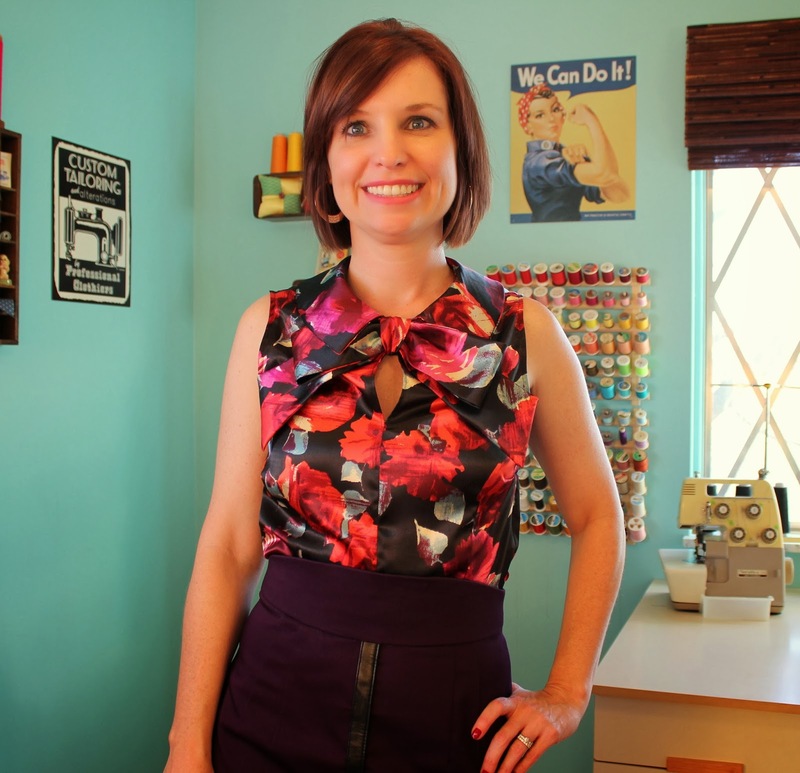 You will become a Fabricista on our blog and become a Julie's Picks Member! Emerald and Mykonos Blue from the Fall Pantone Color Report inspired my outfit-- but I couldn't help but add in a bit of Carafe. I put together a veritable United Nations of sewing patterns with designs from Brazil, Germany and the Netherlands. The fully lined floral Emerald skirt is from the Brazilian pattern magazine Manequim-- the front, back and the waist all have pleating details. The blouson Mykonos Blue inspired top from the German magazine Burda is fully lined with a subtle paisley pattern. 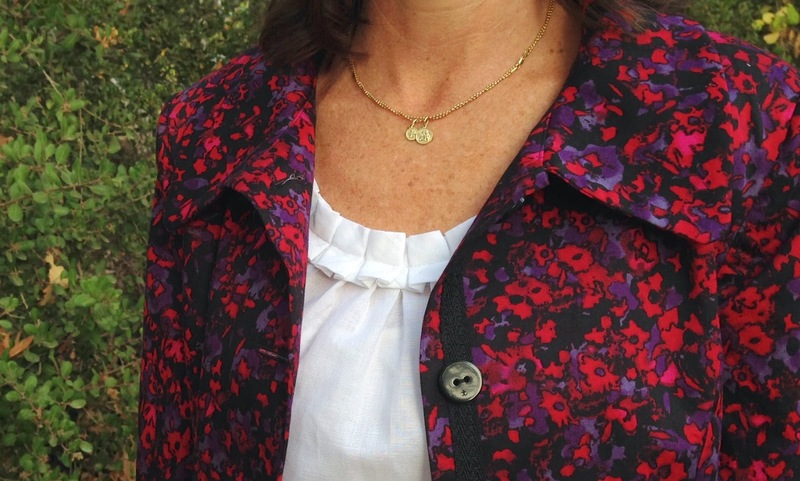 I topped it all off with a cozy ponte knit blazer from Dutch pattern magazine, My Image. The knit blazer is an amazing alternative to a cardigan! 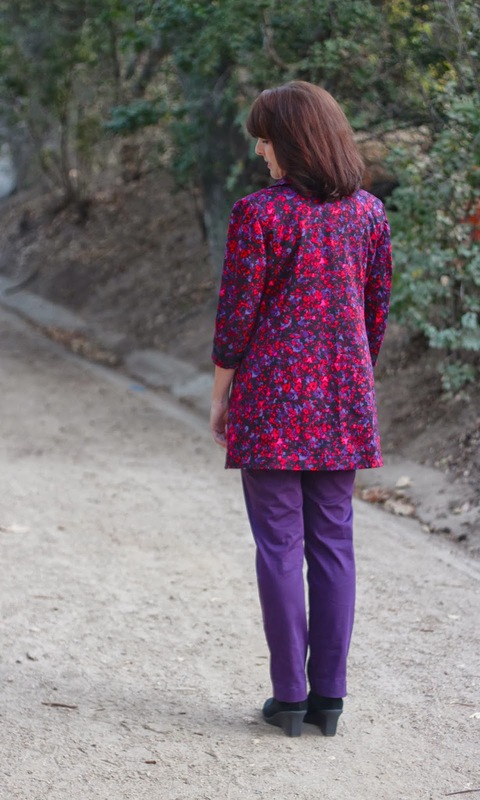 My goal was to sew with a bold color palette, make an outfit with three easy to wear separates and to be able to mix and match each item with many other garments already in my wardrobe. Acai (deep purples) and Samba (vibrant reds), these were the two colors I chose from the Fall 2013 Pantone Palette. I spotted these two hanging out together on this beautiful floral charmeuse. For the bow blouse pattern I used retro Simplicity 2154. The back of the blouse has a keyhole button opening, side lapped zipper and the bow is lightly interfaced for structure. I paired this blouse with a blackberry cotton sateen pencil skirt. 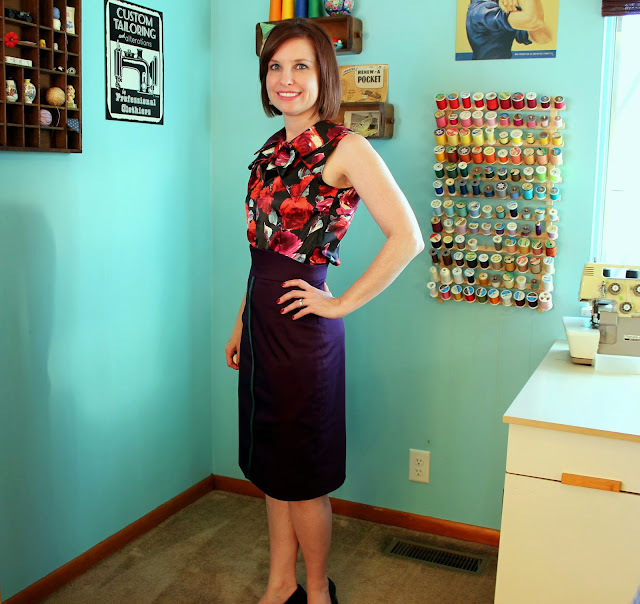 I used the pencil skirt pattern from Gertie's New Book for Better Sewing. When I started to assemble the skirt I noticed there was a line of discoloration running straight down the center of the fabric. With no extra fabric to spare I improvised and used a faux leather strap from an old handbag to cover up the discoloration. This turned out to be a fun detail to the skirt. 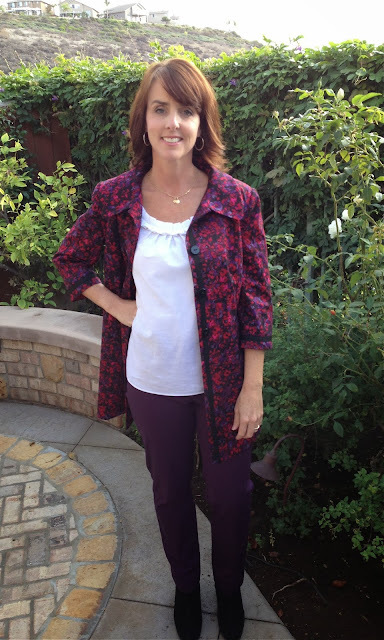 For my third piece I decided upon Burdastyle's short jacket pattern 106a. My original plan was to make a plain black cardigan because I was rather scared to tackle my first jacket but when I spotted this wool houndstooth at Joann's it would not let me leave the store without him. I'm glad too because I think this houndstooth jacket is the perfect contrast to my outfit. I narrowed the sleeves 1 inch and drafted my own sleeve heads. The jacket is fully lined with a rayon bemberg. If you would like to see more pictures of my complete outfit please visit my blog Shanni Loves. I would like to thank everyone at Fabric Mart for hosting this challenge. It has been a lot of hard work at times but very rewarding. I've learned a lot, grown a lot in my skill and have a lot more clothes to wear! Back in Jr. high, my dear friend Adi (who is still my dear friend) complimented me on my purple pants. Any compliment given to an insecure Jr. high kid is a treasure but for me, this was really big since....I had two pair. Some may think it was excessive to have had two fifths of my pant wardrobe be purple but for me and many other girls, purple is a neutral. When I saw purple on the Pantone color chart I knew I needed to head back to my fashion "roots" and make some updated purple pants. For this final challenge, I chose acai (Pantone purple) and samba (Pantone red) to put a twist on a classic outfit every girls needs: a trench coat, chinos and classic white blouse. The fully lined cotton sateen coat was inspired by a Marc Jacobs print trench and has a large rounded collar and trim on the 3/4 length sleeves and placket. 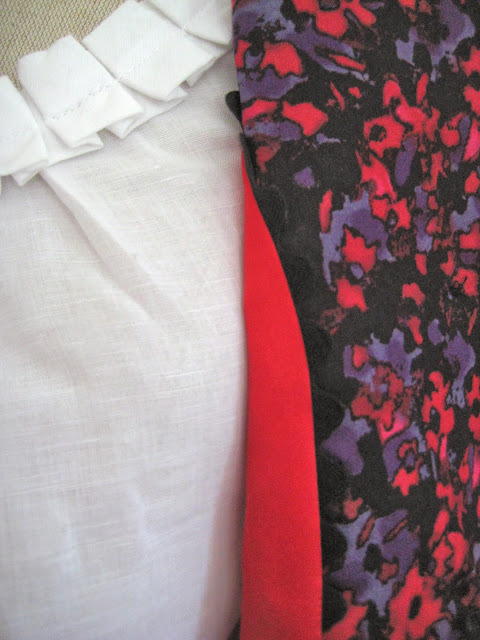 It's lined in a red silk/cotton blend and the lining and facings are piped with black rick rack. The slim chino pants are made from a purple stretch cotton with two welt pockets on the back and a curved waistband. The sleeveless shell has pleats at the center front and is finished with french seams, self bias binding and pleated trim around the neckline. For more information on inspiration and construction please check out my blog. I have thoroughly enjoyed participating in these challenges and seeing what the other seamstresses make. It's made me a better seamstress, stimulated my creativity and boosted my wardrobe! I want to thank everyone at Fabric Mart for this opportunity and I particularly want to thank all of the ladies who have participated. Your work inspires me! No one will go home this week! But only one will become a Fabric Mart Fabricista! The fabricista will have a chance to actively write for our blog. I think it would be fun to do a blog post that had a gallery of all the entries from the contest, so we could see (and admire) them all at once. Nice idea! We will consider putting that together. I love that Shannon had to improvise to cover the flaw in her fabric. The result is a very chic and classic skirt! The whole outfit looks very well put together and I love the colors she chose. I think Diane's ensemble is classy, timeless, and elegantly casual--hard to pull off! Love her use of color! 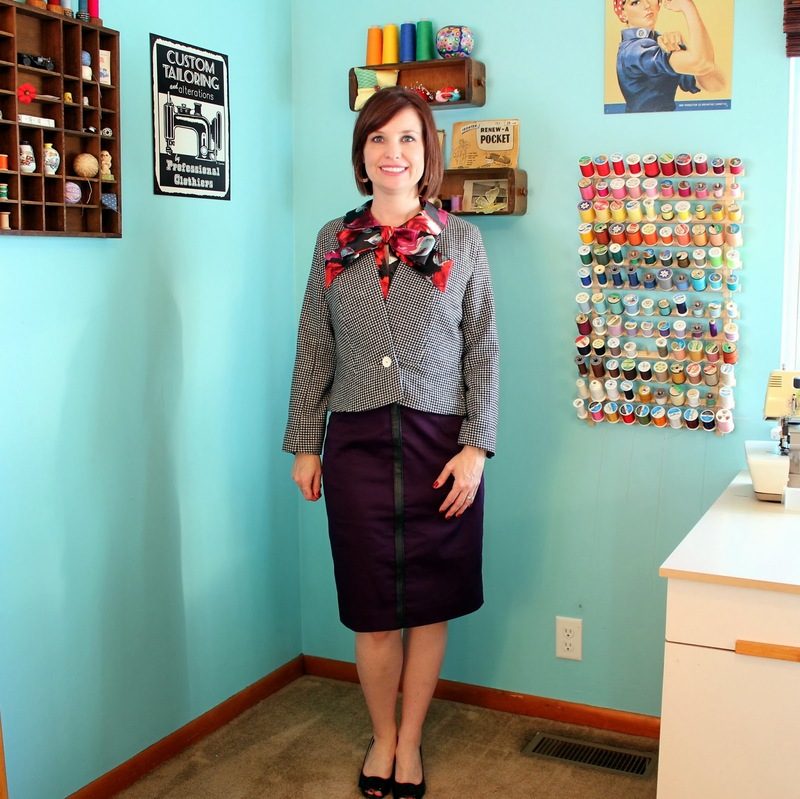 This was such an inspiration to me to get sewing and break out of my self imposed box! Congratulations to each of the participants who did such a great job and put their work on the line---I have great respect for ALL of the entrants and their hard work and will continue to follow their sewing adventures! Now for the really hard part - vote on these three outfits. How can I choose? I would have loved to see what some of the other contestants (that are no longer in the contest) would have made. They were so creative. Shannon ROCKS!!! Classy look, great fit and awesomely put together outfit! Thanks for all the comments! We loved hosting this challenge, I know it was inspiring for us too!